Non-woven fabrics are multi-talented. A company from the German federal state of Saxony-Anhalt has dedicated itself to getting all of the hyper-attributes out of these smart materials. It is on the basis of these highly intelligent materials that the company I.C.S. 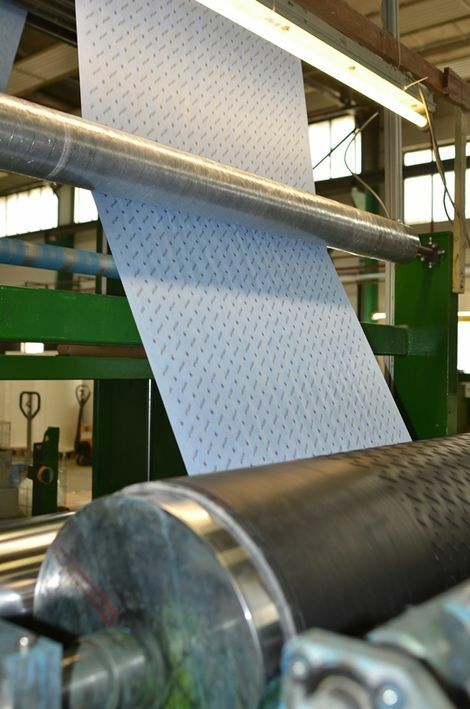 GmbH has developed an oil-absorbent fabric which can absorb 17 times its own weight within the shortest period of time. In the event of petrol, diesel or oil spillages during accidents, roads and waterways can be cleaned rapidly and efficiently. The non-woven fabric works like a magnet. Yet the company from Saxony-Anhalt can achieve far more great things with their non-woven fabrics. The “S” in the company’s name stands for Solution. And that is the exact strength of the company: solving problems. “In simple terms, customers approach us who are dissatisfied with the performance of the materials which they have been using so far and are asking the question of whether they could do things better with a non-woven fabric.” And normally, our answer to this question is: “Yes you can!” Even if difficult problems sometimes take a few months of work to solve. “I don’t like the phrase ‘it can’t be done’,” says Fochler with a smile. Once the perfect non-woven fabric has been found for a customer’s application, I.C.S. places the order for its manufacturing at one of its domestic or foreign business partners. It is in Thale that the non-woven fabrics are subsequently glued, thermally formed, printed on, sewn, cut or stamped. In this light, in view of preventing unnecessary damage to the environment, Claus Fochler believes it would be a good idea if HGV drivers were legally obliged to carry a roll of this non-woven material with them in their vehicle. “They could then take immediate action and wouldn’t have to wait for the fire brigade to arrive.” The oil-absorbing fabric is also suitable for household use, however: if basement oil tanks leak during cases of flooding, the oil can be absorbed straight away. In actual fact, the absorbent pad is only a spin-off product: the material was originally developed for a leading automotive supplier, which had previously used a granulate for the rapid and safe absorption of the cooling fluid from the electric battery in the event of an accident (absorption performance 1:22). The lightweight non-woven fabric now enables a weight saving of almost two kilograms. “This is a pretty big achievement, since with an electric car, weight ultimately means range,” explains Claus Fochler with pride. Achievements of this kind are his motivation. Not to mention the federal state of Saxony-Anhalt as a location. “The federal state offers a positive environment to entrepreneurs,” he explains, before immediately going on to praise his team: “I like working here because I have so many employees who bring their flexibility, creativity and loyalty to the team.” Claus Fochler has made his decision: for non-woven materials and for Saxony-Anhalt – both of which continue to impress him with positive surprises. > Smart Materials in Video: HERE materials think smart. The 90 employees of APK AG might not manufacture gold in Merseburg, but thanks to their innovative process, they can recycle plastic film packaging so well that the plastics to be cre-ated are practically as good as new. The demand is there – and the new production facilities are currently under construction in the Chemical Triangle in southern Saxony-Anhalt. Clean water for everyone. Two innovative companies from Saxony-Anhalt have dedicated themselves to this aim: Carbonit Filtertechnik GmbH from the Dambeck district of Salzwedel and Nanostone Water GmbH from Halberstadt are focusing on intelligent materials to ensure the best drinking water quality for consumers and industry. Each of the companies is taking its very own approach to this objective, however. At the Weinberg Campus, East Germany’s second-biggest technology park, in Halle (Saale) in Saxony-Anhalt, start-ups in the area of life sciences are particularly supported.